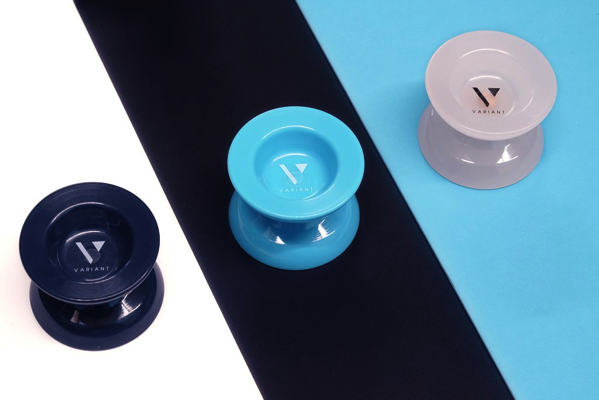 YoYoExpert Blog & Yo-Yo News – Brandon Vu & Magicyoyo present the VARIANT! After reviewing his fair share of plastics Brandon Vu realized 90% of polycarbonate yo-yos fall into two categories; They’re either optimized for stability and spintime, which usually makes them slow and uncomfortable to play with or they’re fun and floaty, but completely lacking in stability and spintime which makes them uncompetitive. He wanted the best of both worlds, so he teamed up with MagicYoyo and Jeffrey Pang to bring it to life! The Variant! In 2017 Brandon travelled to the MagicYoyo factory and began prototyping the design. To ensure its quality, Jefferey Pang was hired to draw and tweak the initial concept over 4 times until the final version was created. The result? A high performance plastic with weight perfectly distributed to give the yoyo a fast and fun feel on the string, but still enough spin time and stability to compete with most metal and bi metal yoyos in the market. After almost a year in the works the Variant is here and is ready to make a dent in the competitive yo-yo scene! Saturday 3/2 @ 10AM EST.